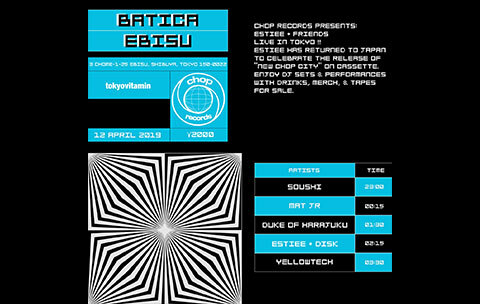 CHOP RECORDS presents ESTIEE + FRIENDS LIVE IN TOKYO!! ESTIEE has returned to Japan to celebrate the release of 『NEW CHOP CITY』on cassette. Enjoy DJ sets & performances with drinks,merch&taoes for sale.